No one wants to be a tourist anymore. People are nowadays looking to live like locals, experiencing the culture through the eyes of a local. We are in search of deeper cultural learning and always looking for ways to travel in more sustainable way. Travellers are these days considered “temporary locals” in some forward-looking cities such as Copenhagen. 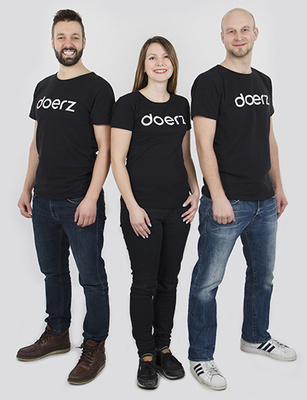 -“We love this trend”, says Tomi Virtanen, the founder of Doerz. “We have been around since 2016. First we started testing in Finland, finding our first experience providers here to offer tourists some real-life experiences. Earlier, people were often asking if it’s legal to offer sharing economy experiences to tourists. Today, with Airbnb and others starting to move to this direction too, it is easier, we don’t have to spend time educating the market anymore”. Tomi goes on explaining the passion behind the idea: “Our founding team comes from Finland and loves experiencing new cities. But we do it with a twist: we’ll go the extra mile to hang out with the locals to do authentic local things together with them. For us that is the best way to feel what the city is all about. We believe in sharing and equal people doing things actively together. Urban culture is something we are very much into and creating cultural impact is close to our hearts”. The promise for the customers is to provide new experiences, experiences that are otherwise not available online in that city. We are answering the questions like: How can I live like a local? and How to find deeper cultural learning while travelling? In some of the cases just making things easy to buy is enough. “Being able to book the experiences online and paying for example through Alipay is a big thing for the Asians. Along having the payments available we went on to translate our site to Chinese language. Moreover, we still have plenty of businesses even in the Nordic countries where cash is the only payment method and the providers have zero online presence. And it is 2018!”. Doerz is expanding in Europe now, French market is freshly launched with Lyon and Strasbourg, Paris following soon. Tallinn has been around for few months and Amsterdam is the next location in just few weeks’ time. -“Even if Europe and soon Asia are very interesting for us, we still see high value in Finland and Nordics. Lapland is our biggest priority in Finland for the coming season. But Helsinki might play a big role in our plans along our hopefully upcoming partnerships”, Tomi says about the near future. Experiences are being listed in five categories: traditions, food, urban culture, outdoors and active. The spread is quite wide, but the common thing with everything is that the experiences are being provided by the true locals who are passionate about what they do. -“Almost all our experience providers, Doerz as we call them, have some other profession, a full time job. Some do this for the money they are receiving. But many do it for being able to meet the interesting people and share the love towards their city, hobby or their passion”, Tomi concludes.